A free, natural, flavorful and pleasant cuisine are the key ingredients of Carme Ruscalleda’s culinary magic. This self-taught chef, who has won seven Michelin stars in her restaurants, is the grand dame of world cuisine and possesses an admirable and precise technique, always exploring and open to the imagination. Now she is celebrating her 30th anniversary with her business and life partner, Toni Balam, at the head of her restaurant Sant Pau, which has put the exquisiteness of the town of Sant Pol de Mar, in the Maresme, on the world map. The Mediterranean identity of Ruscalleda has merged with the Japanese sensibility in her Sant Pau of Tokyo and its menus that tell and draw stories. They are like a kaiseki, a gastronomic ritual that reaches every palate. She shares her poetry of the landscape with her son Raül Balam at the restaurant Moments in Barcelona, where he follows her example as a tireless and creative worker, who continues to live and work with the excitement of the first day, and who transmits this to her brigade of accomplices. She cooks to be happy and to make you happy. Carme Ruscalleda is undoubtedly the most important female chef in Spain and the one with the most Michelin stars in the world (7). The book is a tribute to the 30 years of her career at her restaurant Sant Pau (Sant Pol de Mar), which takes place in 2018. Her culinary hallmark is defined by her ceaseless, highly imaginative, daring, effective and extraordinarily brilliant perfectionism. Each of the chapters of the book revolves around a key concept in her career, interspersed with her recipes, including, in addition to the most current ones, the most emblematic ones that have marked her cuisine. Her establishments are in Sant Pol, Barcelona (Hotel Mandarin) and Tokyo. 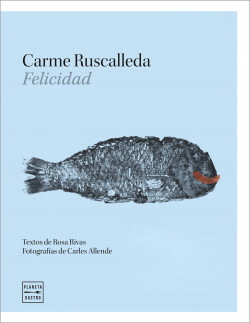 The great tribute book by Carme Ruscalleda, the female chef with the most Michelin stars (7) in the world, on the 30th anniversary of the Sant Pau restaurant.